Anna’s Bart Bixler shoots as Fort Loramie’s Evan Berning defends at Anna on Tuesday. Bixler scored the go-ahead basket for Anna in overtime. Anna’s Wyatt Bensman comes up against the defense of Fort Loramie’s Dillon Braun at Anna on Tuesday. Bensman hit a 3-pointer to tie the game in the fourth quarter. 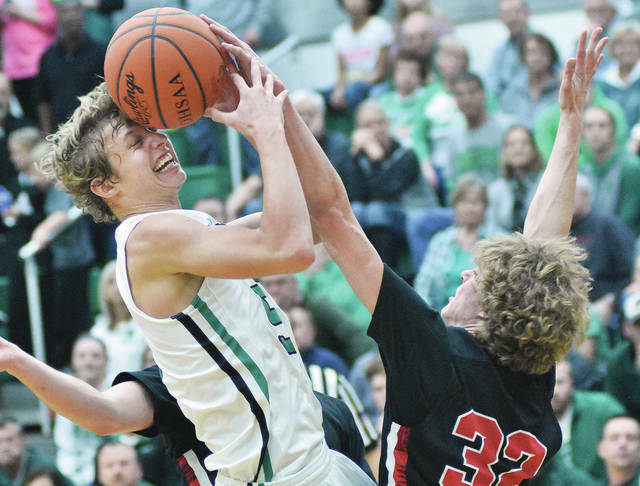 ANNA — Fans had to wait a long time to see Anna and Fort Loramie play this season, but the first meeting between the two Shelby County Athletic League leaders entertained the sold-out crowd at Anna on Tuesday. Anna overcame a scoreless eight-minute stretch in the first half to earn a 54-50 overtime win over the Redskins and get back in the SCAL title race. The Rockets improve to 12-3 overall and 6-1 in the SCAL, while Fort Loramie falls to 14-1 and 6-1. The two squads are tied for first place in the league with Russia (8-4, 6-1). Anna was scoreless over an eight-minute stretch in the first half, during which time Fort Loramie built a 13-point lead. With the help of the 10-2 run at the end of the third quarter, the Rockets battled back and tied the game with a minute left in the fourth on a 3-pointer by Wyatt Bensman. Bart Bixler completed a three-point play in overtime to put Anna ahead, and Bensman helped seal the win with four free throws in the final 31 seconds. Anna took a 46-43 lead in overtime after Bixler made a basket and foul shot with 2:33 left. Evan Berning made two free throws with 1:54 left to cut the lead to one point, but Riley Huelskamp made a free throw with 50 seconds left to push the lead to 47-45. After a steal by Huelskamp led to a Fort Loramie foul, Bensman hit two foul shots to push the lead to 49-45 with 31 seconds left. Bensman made two foul shots with 15 seconds left increase the lead to six points. Nick Brandewie hit a long 3-pointer with three seconds left to cut Anna’s lead to 53-50, but Huelskamp made a free throw to close out the win. Close games haven’t been Anna’s strength this season, while Fort Loramie has excelled at them. The Redskins have won three games by five points or less, while all of Anna’s losses were by three points or less. Bensman said battling back from a deficit made the win over the top-ranked Redskins even sweeter. Though the loss was the first for Fort Loramie, coach Corey Britton said it highlighted issues the team has had in putting games away after jumping out to a big lead. “We’ve won, but I think that covers up some deficiencies and clouds your judgement a little bit,” Britton said. “We talked yesterday at practice that we had a lead in the Versailles game (a 48-46 win) and couldn’t hold on to it, went to Minster Saturday night (52-51 win) and had a lead and couldn’t hold on to it. Bensman led Anna with 17 points, while Griffin Doseck and Mason Platfoot scored nine each. Dillon Braun led Fort Loramie with 15, while Berning added 11 and Tyler Siegel finished with 10. Bensman hit a 3-pointer from the left wing with 1:04 left in the fourth quarter to tie the game 43-43. 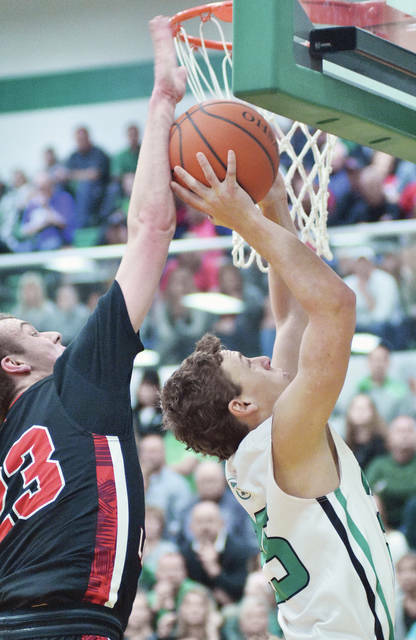 Both teams missed shots in the final minute of regulation — including two by Fort Loramie in the final 10 seconds that hit the rim. Braun hit a pair of free throws with 5:50 left in the fourth quarter to surpass 1,000 career points and give Fort Loramie a 36-29 lead, but Huelskamp made a pair of free throws four seconds later to cut the deficit back down to five. The Redskins led 38-33 with 4:38 left in the fourth, but Huelskamp made a basket on a drive and followed with a free throw after a foul with 4:15 left to bring Anna within two points. Siegel made a free throw to extend Fort Loramie’s lead to three, but Platfoot made a 3 from the top of the key with 2:40 left to tie the score 39-39. Siegel made two free throws with 2:47 left to put Fort Loramie ahead 41-39 and then added another with 1:49 left to extend the lead to three points. Fort Loramie used a 15-0 run to help build a 21-12 halftime lead. Siegel hit a basket to cap off a 7-1 run and give Fort Loramie a 32-19 lead with about 2:30 left in the second, but Anna finished the quarter on a 10-2 run to cut the gap to five points. Doseck and Platfoot capped off the Rockets’ run with 3-pointers, with Platfoot’s coming from the right corner at the buzzer. Britton said he’ll take the blame for Fort Loramie’s second-half demise. Platfoot hit a 3-pointer from the top of the key with 1:28 left in the first to give Anna an 8-6 lead. The Rockets didn’t score over the next eight minutes, though, while Fort Loramie scored 15 points in that stretch. Berning made a shot off the glass and Braun hit two free throws in the final minute of the first to put Fort Loramie ahead 10-8. Siegel hit a basket to open the second quarter, then Braun and Berning made inside shots over the next three minutes to push Anna’s lead to 16-8. The Rockets called a timeout, but Fort Loramie’s run continued. Brandewie hit a 3 with 3:53 left, then Braun added a basket on a drive with 3:12 left to give the Redskins a 21-8 advantage. “It looked like we were stagnant and got punched in the mouth early,” Barhorst said. “Not making our cuts the way we need to, not sharp in making them. We kind of let them dictate what was going to happen offensively for us. They came out and hammered us, but we made some adjustments at halftime, going with more of a flow on offense trying to get ball movement. We finally got that. Doseck and Joel Cathcart made baskets in the paint in the last 1:02 to cut Fort Loramie’s halftime lead to 21-12. The teams already were supposed to have played twice this season, but both the first two originally scheduled matchups were postponed. They’ll play again on Feb. 10 when Anna travels to Fort Loramie. Both teams will continue SCAL play on Friday. Anna travels to Jackson Center, while Fort Loramie hosts Fairlawn. Contact Bryant Billing at (937) 538-4818, or follow @SidneyOHSports on Twitter. This entry was tagged Anna, Bart Bixler, basketball, boys basketball, Corey Britton, Dillon Braun, Evan Berning, Fort Loramie, Griffin Doseck, high school, Mason Platfoot, Nate Barhorst, Redskins, Riley Huelskamp, Rockets, SCAL, Shelby County Athletic League, Tyler Siegel, Wyatt Bensman. Bookmark the permalink.